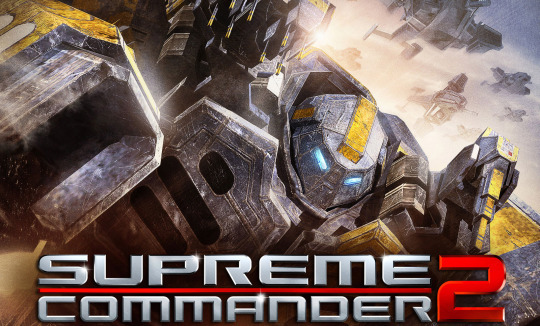 Upcoming DLC for Supreme Commander 2 Detailed. 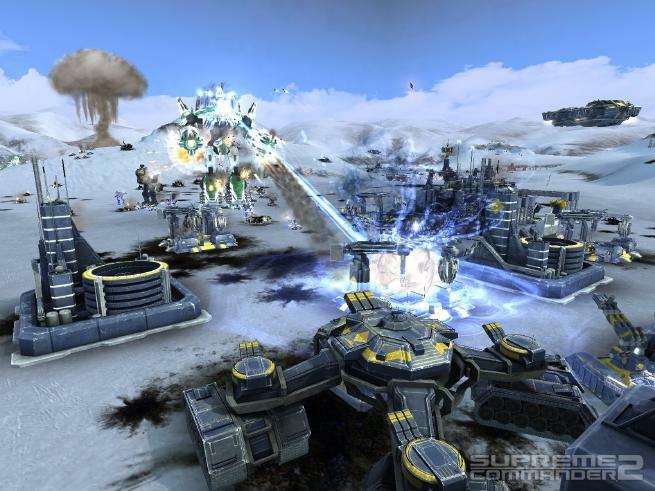 The upcoming DLC for Supreme Commander 2 will be released tommorow for the PC and Xbox 360. 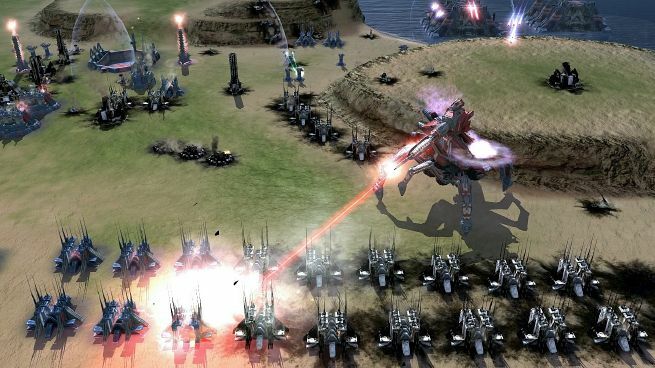 The news of the DLC came in after a large patch was applied via Steam to Supreme Commander 2, the new game option to exclude “DLC units” in multiplayer games arose the speculations of a new DLC for the game. The DLC will feature new units, maps and research. It will be available for €9.99 / £6.99 via STEAM and for 800 Microsoft Points on Xbox LIVE. Way Station Zeta – This installation sits high above the surface of Gradius IV. Decommissioned after the Seraphim invasion, it served as a staging area for Cybran forces during the Infinite War. 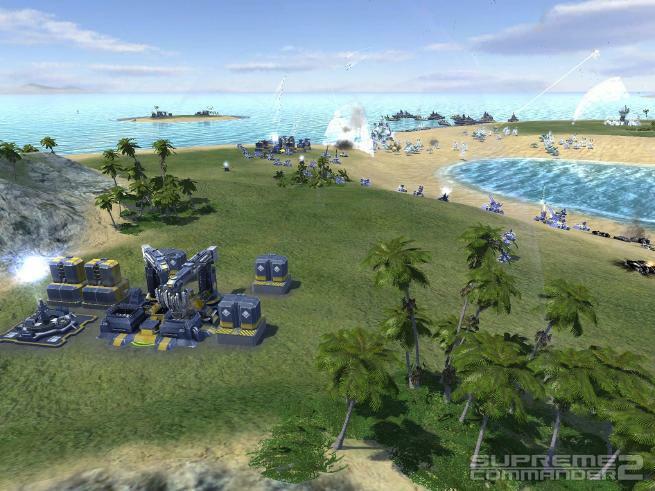 Rigs – Many years ago, people harvested organic fuel from pockets beneath the seas of Pegasus II. Companies erected massive rigs that now sit on the surface of the water. It takes a cunning balance of sea and air to control the mass that remains on these ancient platforms. Etched Desert – As water on this desolate landscape receded due to decades of environmental exploitation on its surface, mass rich deposits were discovered among the remaining eroded mesas. With plenty of area to explore and hide, the battles here have raged for millennia. 4 player map on 360 and PC plus exclusive double-size 8 player version on PC. Desolatia – This tiny island can be found in the most remote parts of the Hermetic Seas on Trexxa VI. Its average seasonal temperatures reach well below zero, making it uninhabitable by humans. Its mass deposits, however, give it unparalleled military value. 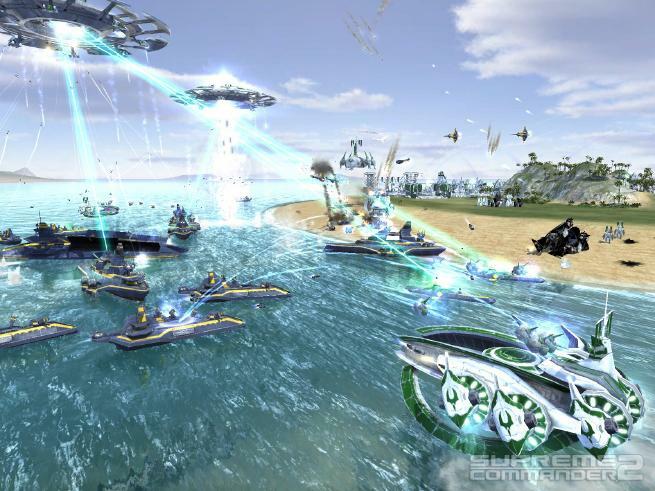 Seraphim Isles – The Isles were discovered by a second group of settlers who made contact with the alien Seraphim race. Legend has it that the two coexisted for many years; others claim the Seraphim eliminated them on sight. Nothing remains today of either race but the mountain in the center of the primary island holds a forgotten mystery for Coalition scientists. Igneous – The islands called Igneous were named for their strange rock formations. They remain one of the more “alien” regions on Rigel II, and one of the less popular areas for colonizing even though they’re rich in mass deposits. QAI Labs – Located high above the surface of Pollux IV, this is one of the many test environments used by noted technology company Quantum Visionworks, a division of QAI Industries. Tourneydome – Among relics of a city that stretches to the horizons lies an arena where the Coalition’s best do battle. A system long abandoned by the Coalition, when commanders enter, only one leaves. 4 player map on 360 and 8 player map on PC. Cybran Monkeylord: Experimental Spider Bot: The beloved SUPREME COMMANDER experimental makes its return with a legged creature that features a powerful laser mounted on top of the body. If this unit makes it to your base, you’re already dead. UEF Aegis: Experimental Shield Generator: A large bubble shield that covers an entire base. The shield has high health, but if knocked down it has to be manually recharged at a high energy cost. UEF Super Triton: Experimental Dreadnought: This ultra-battleship is bristling with humongous cannons but is only able to fire a medium distance, unlike the regular Battleship which has a long range. These weapons do extreme damage, but having to get close enough to use them is its weakness. UEF Field Engineer: Mobile Repair and Support Unit: The UEF Mobile Repair and Support unit is a mobile engineer that has a basic direct fire turret as well as a repair arm. It is unable to build new structures, reclaim or capture, so its strength lies in its ability to accompany and quickly repair nearby allied units. UEF Research Converter: Research Conversion Facility: This structure provides the option to generate Research directly from accumulated mass. It is highly inefficient, but produces an instant boost to research. Illuminate Sooprizer: Experimental Gunship: The Illuminate Mega-Gunship offers a devastating direct-fire alternative to the Darkenoid. It does not have any anti-air capabilities focusing on ground based damage and increased survivability against surface threats. Illuminate Illuminator: Experimental Intel Gathering Station: The Overhorizon Radar provides flawless Vision and Radar in a huge radius. However, it has a tremendous energy cost to activate, and a long cooldown period. Illuminate Buhbledow: Experimental Shield Destroyer: The Shield Smasher is a ballistic EMP missile designed to knock down all enemy shields in a wide area. It has a long enough range that it can cover most of the map. The blast does insignificant damage to structures and units. Illuminate Shotja: Sniper Bot: The sniper unit is a medium ranged, mobile hover unit. It has a single, high damage shot with a long cooldown. Its weakness is its low rate of fire and slow movement speed. Cybran Recycler: Mass Reclaimer: Similar to the Loyalty Gun, the Mass Reclaimer has a medium range and automatically reclaims nearby wreckage. It is unable to reclaim living units, however. Cybran Cicada: Experimental Cloak Generator: The Cicada is a mobile mini-experimental that, when activated, hides all units nearby from both vision and radar. This makes the units completely invisible to an opponent. The Cicada has a high energy cost which lasts for less than a minute before recharging. The complex unit lacks only the ability to cloak itself while in operation. Cybran Intellitron: Air Scout: Lightly armored and unarmed, but with advanced vision and radar. Allows for quickly scouting remote areas of the map. Very fast to outrun anti-air. 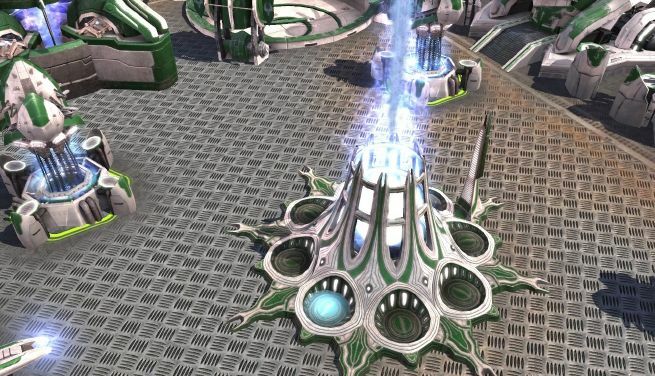 Cybran Boomerang: Nuclear Missile Defense: This structure is placed in a base to defend against nukes. When incoming nukes get in range, they are reprogrammed and sent back to their origin. It has a low rate of fire and can be overwhelmed. Redirected nukes spoof enemy Anti-Nukes, making this a deadly structure to overlook when scouting for Nuke targets. Research is focused on diversifying the factions while maintaining each faction’s identity. This naval tree upgrade allows experimental transports to carry naval units. This short duration ability gives select land units a burst of speed for an energy cost. Boost: Structure Build cost for ACU: decreases cost of structures for ACU. Adds a torpedo weapon to the Illuminate tank, allowing it to hit submarines or other naval units from a distance while on water. Adds an ability to all structures, allowing it to be sacrificed. When sacrificed, all units nearby are instantly healed. Nearly all ground structures can now be built on water. Adds an ability for air units to teleport short distances. The Cybran navy gets even more amazing with the Naval Jump Jet upgrade. At the end of the tree and incredibly costly, this upgrade allows Cybran Naval units to traverse any terrain with ease. This upgrade adds a vision radius to long range artillery shells. When a shell impacts the ground or a shield, it leaves behind a small vision ring, allowing you to see into the enemy base.